Do you know what is the busiest time for carpet cleaning? Well if you haven’t guesses already it is the end of the month and the very beginning. At the end of the month around the 27th-31st people are moving out of their residence and are usually required to have the carpets professionally cleaned. At the beginning of the month people are moving into new residences are wanting to have the carpet cleaned because they are not sure if the carpet was actually cleaned. It’s all a vicious carpet cleaning cycle. So when should you schedule your carpet cleaning? Well, if you are needing to clean your carpets because you are moving out you should schedule at least a week in advance. Usually the closer to the end of the month the faster appointments will book up. At the beginning of the month it’s usually best to book your carpet cleaning within 48 hours. Carpet cleaners in San Antonio will want to take advantage of the business and increase their prices but Beyer Carpet Cleaning does not. Beyer understands when you are moving out that you don’t want to invest money into a residence you will no longer be living in. Beyer Carpet Cleaning tries to keep their prices low and affordable for everyone. However, Beyer Carpet Cleaning is staying competitive and after being open for a year they have decided to make a few changes to their pricing. As of right now Beyer Carpet Cleaning has increased the price of cleaning stairs. It use to be $1.99 per step but is now $2.99 per step. Beyer Carpet Cleaning has increased the price because to clean stairs it is labor-some and requires different tools in order to clean them. The average prices to clean stair is about $3-$4 per step. 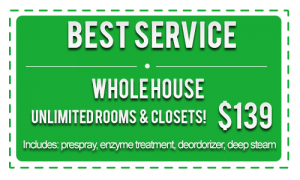 Beyer Carpet Cleaning always wants to offer the lowest prices so they will continue to offer prices on the lower end of the carpet cleaning scale.